Ah, Autumn! Nice, warm and cosy. The arrival of autumn brings in the transition from summer to winter with a hint of pumpkin spice lattes to pumpkin pies and festivity all around. No wonder why we call it Autumn Magic because it is marked for the arrival of Halloween, Thanksgiving and many other autumn festivals. Our very first card is by ColourDreams, which describes that Autumn is not only about falling leaves or pumpkins but it also about these two little and cute pussycats. The colour and the feel of the card is very autumn-ish and we love it. The next one in line is by BottleCapGuru, this card has a very beautiful poem addressing autumn. 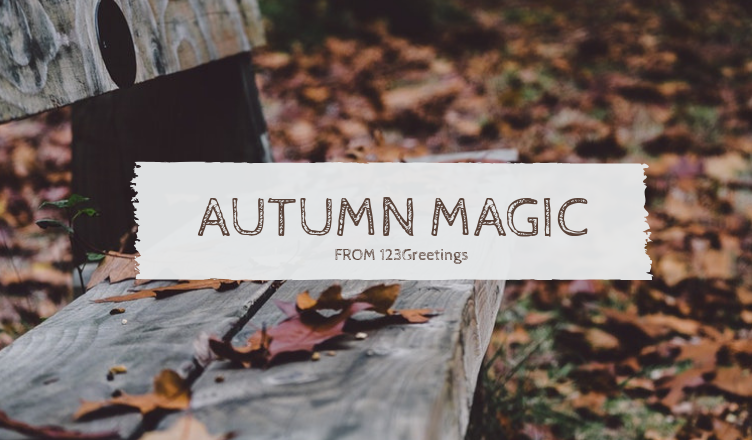 The message portrayed through this card is completely surreal and we can’t deny the fact that Autumn is Magic. Any festival around us is incomplete without friends and family. Our next card is all about that by universelover,with all the love and affection this cad touches our soul in a glance. The simple font and style is what we vouch for. Fresh and a bundle of flowers can make anyone day. So lets see our amazing flower card by RedHedRules for this autumn season. The animation with those wonderful use of colors surely makes it our favorite. Get ready to send this to your loved one. We hope you love our autumn cards just as we do. And get yourself ready with your family and friends this festive season.